Among the 72 leading contributors to Los Angeles City Hall Politics, the largest group is made up of those who represent others' interests as well as their own. 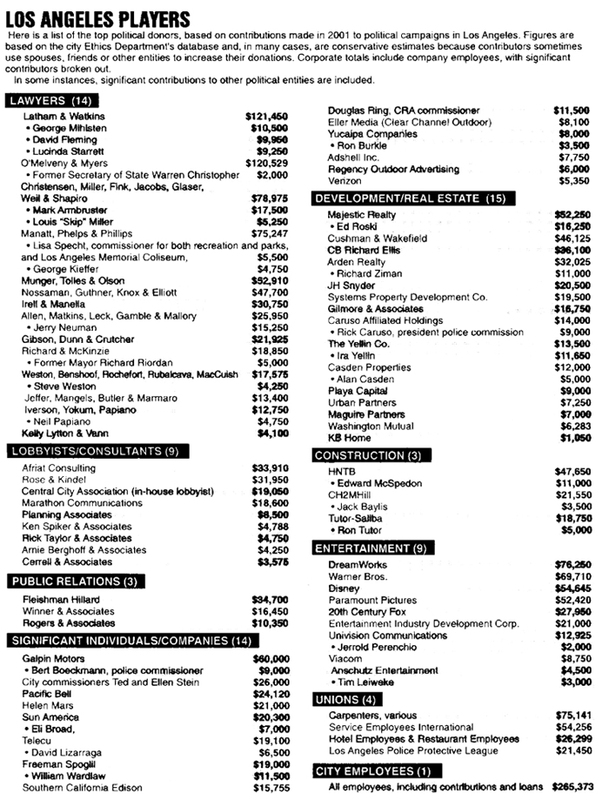 It includes 14 major law firms, three public relations outfits, and nine lobbying and consulting firms -- all paid handsome fees to use their access to politicians and top bureaucrats that they've cultivated over the years to influence City Hall's decisions. Note the Politics Peddlers list below -- note Douglas Ring. Ring is the Community Redevelopment Agency Commissioner, a developer, and he's the husband of Councilwoman Cindy Miscikowski. Conflict of interest? What do you think?